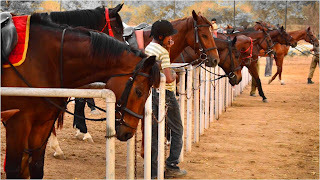 Arvind's World: My experiments with horse riding & making sense of horses! My experiments with horse riding & making sense of horses! 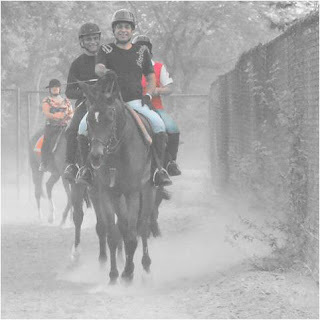 I learnt horse-riding, for the first time, as a part of mandatory training during the foundation course of IAS in Mussoorie Academy from 1991-93. It used to be extremely hilarious when we all struggled during those days and how some of the officers invented all sorts of excuses to avoid attending those training classes. When one of the officers, out of sheer fearful frustration asked the trainer in the Academy as to why should one be learning horse-riding, the reply was that one can control (administer) the District very effectively if one knows how to control a horse! And prompt came the retort that in that case, the riding instructor should be running the country!! There’s a saying, “A horse is the projection of peoples’ dreams about themselves-strong, powerful, beautiful-and it has the capability of giving us escape from our mundane existence”. The riding in the Academy was very user-friendly as most of the horses were well trained and all one needed to do was to balance oneself on the horse properly and the horse used to take care of the rest as they were trained to follow the horse in front and voice commands from the trainer. In that sense, the horse-rider had little control. It was enjoyable experience and gave all of us a sense of confidence. Even till day, not a single get-together of our batch mates passes off without discussing some interesting incidents of those horse-riding days. Thanks to a friend, I took up horse riding after a gap of almost 20 years. We were having lunch one day when he informed that he has been horse-riding now for about six months and why shouldn’t I join him. It was an interesting offer. Of course, I have put on weight, rather sumptuously since the last time I rode and my instant thought was whether the horse can carry my weight! Well, i was not willing to take into consideration the age factor and whether my nerves can still be agile enough to take up horse riding. However, the comforting factor was sitting right in front of me, my dear friend with all his weight (his girth certainly is bigger than mine) and his age (well, he might not be colouring his hair)! And I went to Army Polo and Riding Club, Naraina along with him. The riding here is very different from what I had supposedly learnt in my Academy days. The horses are bigger & independent and don’t go by the common voice command of the trainer. One has to take charge. I started slowly and was doing walking and a bit of trotti ng in first few days. Basic gaits of the horse include (1) Walk – a slow, flat footed gait with four beats, about 3-4 miles per hour. Walking is good to warm up the horse’s muscle before hard work; (2) the trot – the trot is a two beat gait in which the diagonal (opposite corners) front and hind legs move and hit the ground together as a pair. It has suspension meaning that there’s part of the time when the horse is off the ground. This is what gives the trot its bounce. The trot is about 6 miles per hour. Trotting is a good exercise for both horse and rider. The rider can ride posting, sitting or balancing in a two-point position. A good rider can do all three. 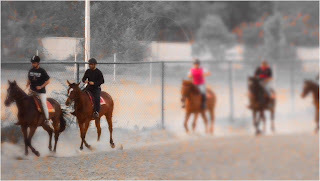 The trot is the least tiring for the horse and they can cover long distances while trotting;(3) The canter – the canter is a three beat gait with suspension. The canter is a medium gait, about 8-10 miles per hour. The rider usually sits up tall in the saddle when cantering and should keep his seat deep and relaxed to follow the rolling movements of the horse’s back; (4) the Gallop – the gallop is a horse’s natural speed gait. It’s very much like a canter speeded up. The gallop has four beats instead of three and the suspension is longer. The horse pushes off harder, reaches farther with his legs and stays up in the air longer between strides than he does in the canter. I gradually moved to canter in my third week and have been doing cantering regularly since then mixing it with trot. Horse riding, especially the way, we manage horses tells so much about the personality of the rider. One can easily make out when one is frightened by the manner one sits on the horse or rides. Its interesting how the same horse behaves differently with different riders depending upon the comfort level of the rider. Horses, I feel, are extremely intelligent and can make out in an instant about the experience, knowledge and comfort level of the rider within first few minutes and behaves accordingly. There are two categories in horses – ones which are like children and are naughty. When they find that the rider is new or not comfortable, they literally take him for a ride and try and unnerve him in every possible manner. They will skip, buck, canter on their own or will refuse to move. Basically they decide what they want to do. The second category is those horses which are matured and act like one. Once they observe the uncomforting newness of the rider, they treat him with care and try and give him confidence. They just give the impression of being an indulgent parent. I would like to mention a particular horse in this category of APRC – Alibaba. He is the first preference of any new comer and is a must for anybody entry in the world of riding in APRC. Likewise, there are few horses who are very disciplined and will take care of their riders especially if one is new. One such horse is “Romeo” and it’s almost hilarious how most of the kids keep requesting for Romeo every morning! The riding hours are from 6-6.40 am in the first batch and 6.50-7.30 am in the second batch. It means getting up at 5 am and setting out by 5.30am. I have an advantage as my house falls in the way of my friend’s route who graciously picks me up in the mornings. The fact that i have to get up early , this implied that i started sleeping in time and which meant cutting down on social gatherings and social drinking. It has in a way brought so much of discipline in life and a time has come when friends have stopped inviting me for late evening gatherings knowing well where my priorities would be! I started as being a guest of my friend as i wasn’t sure initially whether I would continue with this adventure beyond first few sessions. But once i started cantering, I realised the feeling of freedom. 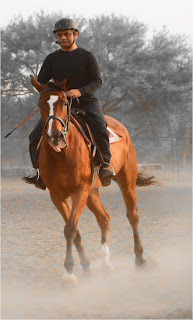 The feeling, when the horse is rhythmically cantering with his full glory, is that of being in control of almost the entire world (now I realise why riding is compulsory in IAS Academy). As they say “horses lend us the wings we lack”. I am reminded of an Arabian proverb, “The air of heaven is that which blows between a horse’s ears”. There’s nothing in the world which i feel can describe this feeling of sheer sense of completeness, with droplets of sweat making their way from the sides of one’s helmet, that wheezing sound of the wind as one is riding through the sky. It almost makes riding synonymous with freedom. As they say, a canter is the cure of every evil. One forgets all worries, tensions and all the routine pre-occupations and its one of the best forms of meditation in that sense. The saying “A horse in the wind, a perfect symphony” that way perfectly describes the exact feeling of a rider in control. I am now almost hooked to riding and have got a membership of APRC. Beryl Markham very rightly had said that “A lovely horse is always an experience... It is an emotional experience of the kind that is spoiled by words”.It’s not as if everybody has a safe riding. There are occasions when there have been falls and one of them was a bit fatal one. Horse sense is the basis of horsemanship. This is the ability of a person to understand horse and even to think like a horse. The better one understands horses, the more one can enjoy them and a better rider he will be. Horses are large and powerful animals but they are also timid and easily frightened. Isn’t this quality like a child? As Josephine Dermot Robinson said once “Horses and children have a lot of the good sense there is in the world”. Most horses are gentle and obedient if they are handled properly. Horses are among the most forgiving animals. There are certain rules such as that we should praise them often and punish them very seldom. Gentle treatment will gain horse’s respect. Harsh and cruel treatment makes him fear us. We should also never stand directly being or in front of a horse. A frightened horse may kick or run over us and i have seen somebody actually getting kicked once. Another interesting fact i was told was that horse should never be hand fed. Fingers may be mistaken for treats and be eaten. I smile every time I think of this warning. Fearful – horses are big and powerful but fearful creatures. If they are frightened, they will run away from whatever scares them. They are normally scared by loud noises, and things that move suddenly move towards them. If one acts frightened, his horse becomes more frightened as he feels that something must be wrong if his rider is frightened. Habit and training- horses don’t know they are powerful, bigger and stronger. Otherwise, they would realise that they needn’t obey us! We should always handle horses using the same rewards and punishment they are used to. Reward and Punishment – horses learn how to obey commands and to do or not to do certain things by connecting them with pleasant (reward) or unpleasant (punishment) feelings. A horse can pay attention to a reward or punishment for a maximum of about 3 seconds. It means that the pleasant or unpleasant feelings must come immediately after the horse has done something deserving it. Rewards are not always feed, carrots or apples. They can also be kind words & petting. Punishment, likewise, can also be a harsh, sharp voice or not allowing him to do what he wishes to do otherwise. Reward & punishment should fit the situation and must be fair. If he doesn’t know why he is being punished, he will look for ways to get away from a rider who hurts. I am reminded of a saying “ If your horse says no, you either asked the wrong question or asked the question wrong”.Horsemanship includes how to adjust one’s stirrups, mounting a horse and dismounting, sitting positions, holding reins, aids (natural – hands, voice, legs and weight and artificial – crops, spurs and whips) and how to use them. I have tried the ‘voice’ aids with my horse and it really works. They seem to listen to you and respond. 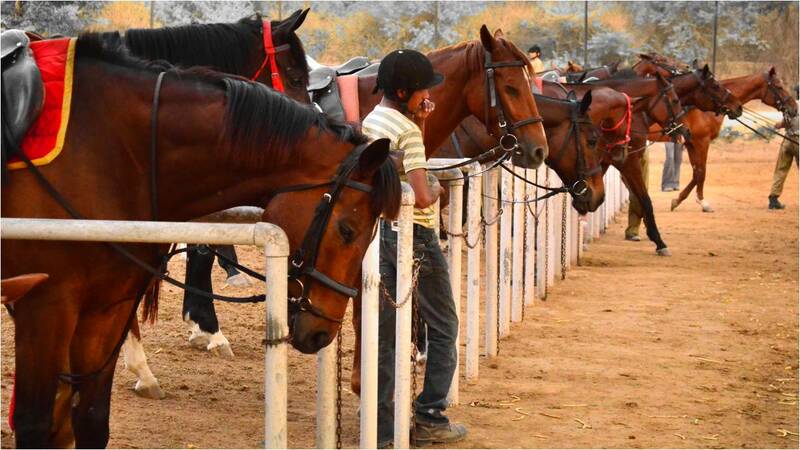 My friend who is a Keraliate speaks to his horses in ‘malyali english’ and it’s at time a really hilarious sight. But it seems to work and all horses seem to getting used to that typ e of communication! I have just begun this journey and realise that i have a long way to go. It brings in discipline, all the ingredients of management training and ultimately, makes one a better human being. I am loving it and intending to make it a long term affair! 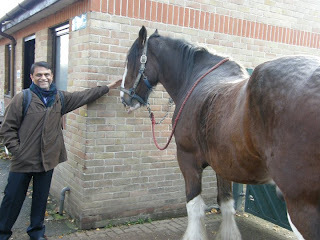 I have made some wonderful friends, both human beings and horses and am learning horse sense finally! As someone once said “ ask me to show you poetry in motion and i will show you a horse”. So, are you Feeling down? Saddle up buddy! We went on a vacation to Kashmir and one of the highlights were the pony rides, initially it was a little scary but then we got the hang of it. They should make it compulsory for politicians to learn horse riding. Perhaps then the coinage "Horse Trading" will hold a new meaning. Nice write up. As for the missing social gatherings, you can always borrow the phrase from JW ..." Keep Trotting." I hv read the article about DBT. It clears a lot of doubts I had in my mind. But still I just want to clear one more thing, that the benefits or the subsidy which govt. is transferring to the beneficiaries, will be as per the Govt. rates while some other things which people have to purchase from the market will have much higher market price. Increasing Insurance coverage - catch them young!